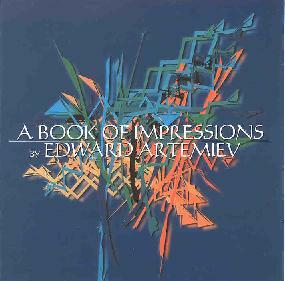 Edward Artemiev - "A Book Of Impressions"
Russian electronic musician and composer Edward Artemiev is probably best known to the world at large for his soundtrack work on several Andrei Tarkovsky films (Solaris, The Mirror, Stalker). However, Artemiev's film credits in his homeland are extensive and, having begun his explorations into electronic music in the early 1960s, is renowned for his pioneering work in the field. A Book Of Impressions compiles several tracks (previously unreleased I presume) recorded between 1975 and 1996. Artemiev's music is truly symphonic in that he succeeds in reproducing the capabilities of a full symphony, utilizing the wonders of electronic musical technology combined with his own impressive compositional skills. Vangelis' film scores are a good analogy. But what really struck me while listening to A Book Of Impressions is the variation of styles... from large majestic symphonic works, to dark, subtle, yet highly thematic pieces, to more experimental compositions that demand the listener's attention. The set opens with "Out There, Where", on which Artemiev brings out the full electronic symphony, percussion, horns, and all. I think we take for granted the sounds that are reproduced by synthesizers and close listening reveals a startling replication of the sounds produced by "real" instruments. But there's also the gorgeous sympho keyboards that we know so well from progressive rock musicians. "Ritual" and "Touch To The Mystery" are interesting spacey ambient tracks. "In The Nets Of Time" is a spacey piece with waves a sequenced patterns and a pounding industrial drone. "Noospere" features flowing waves of ambient spacescapes and drones and is much more subtle in its development than the other tracks on the album. "Mirage" and "Intangible" each include similar ambient spacescapes but are embellished by bubbling trippy synth sounds and grand, prog-rocky keyboards. But it's the lengthier tracks that are the highlights of the album, due to the Artemiev's talent for developing themes that entrance the listener. "I'd Like To Return" opens as a dark atmospheric piece. But soon a parade of sounds march through giving the music a more avant-classical sound, including voice samples, brief percussion runs, trippy space synths, and much else. Things get very intense as I felt like I was being blasted through a time warp or swept into a black hole, the pace of the music racing off into the stratosphere with a rush of percussive sounds and electronics... only to abruptly descend into a peaceful, heavenly realm of meditative music and angelic choirs. An excellent track that succeeds on the compositional level, in the use of sound, and thematic development. "Three Regards On Revolution" has heavenly New Age music combined with Artemiev's more avant-classical leanings and embellished by swirling space synths. Things get a bit intense and there's lots of synth sounds that inject a welcome space freaky element to the music. But the music on this 13 minute track soon evolves through multiple themes, from symphonic classical, to quietly meditative, changing the mood of piece continually between bright and dark, intense and subdued. Finally, at 17 minutes, "Peregrini" is a true symphonic space epic that combines ambient space, progressive rock, and classical. Sometimes dark, sometimes majestic and uplifting, the music moves seamlessly through its varied themes with lots of spacey patterns that recall the very best of bands like Tangerine Dream and Vangelis. And noting that this track was recorded in 1975, it's clear that Edward Artemiev stands tall among those electronic progressive pioneers. Fans of the genre would do well to explore his work, and A Book Of Impressions is a solid starting point.